Pharma Marketing Blog: Paula Deen Loses 30 lbs. Urges Twitter Fans to Pig Out on Fourth of July! Paula Deen Loses 30 lbs. Urges Twitter Fans to Pig Out on Fourth of July! 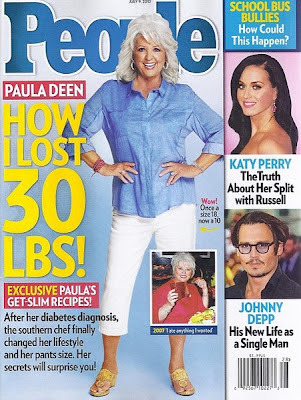 Whilst on the supermarket checkout line, I noticed the cover of the latest, July 9, 2012, People Magazine that featured Paula Deen (see image below). "How I Lost 30 Lbs!" was the headline. Under the banner announcing PAULA'S GET-SLIM RECIPES, the magazine invites us to learn her "secrets": "After diabetes diagnosis, the southern chef finally changed her lifestyle and her pants style. Her secrets will surprise you!" Deen is really looking good and I cannot wait to discover her "secrets." But, first, I should note that Deen lost those 30 lbs not immediately after she was diagnosed with diabetes over three years ago, but after she signed on with Novo Nordisk to be their diabetes/Victoza spokesperson (see "Paula Deen & Victoza: Brilliant or Dumb?"). Since then Deen and her sons have been creating recipes for "Diabetes Light," a Victoza-branded web site that features "Recipes from Paula with a Dash of Inspiration" (here). BTW, Novo should get a more recent photo of Deen than the one it currently uses on the "Diabetes Light" website (shown on right). The current one shows a much heavier-looking Deen prior to her recent weight loss. I wish Deen luck in keeping her weight loss. I know from personal experience that you can lose 25-30 lbs if you change your diet, but quickly gain it back once you regress to your old ways of eating. Fried chicken reduction. Deen says she eats fried chicken only once a month. Potato reduction. She has not cut out eating potatoes, but she has cut down on eating them. Eating vegetable from her own garden and creating healthy recipes. Butter reduction. She has cut her butter consumption in half. Eating Greek salads and baked fish. I suppose I can eat just one Cheesiest Fried Chicken Empanada with a touch of Chili Con Queso Dip, but how am I supposed to eat just a bit of Bacon Wrapped Grilled Corn on the Cob, which calls for 1 Lb of bacon for 8 ears of corn? That's 2 oz. of bacon (300 calories) per cob, not counting the butter I would likely spread on it! In my opinion, this demonstrates what I'd like to call "Pharma Multiple Personality Disorder (PCMPD)" where a celebrity promotes one lifestyle under contract with a pharmaceutical company and then promotes the opposite for other business purposes (eg, as a Food Channel chef). The fact that Deen has lost 30 lbs is good news for Novo, which received a lot of criticism for its choice of Deen as a diabetes spokesperson. To date, my little poll (below) suggests that a plurality (if not a majority) of people believe the Novo Nordisk deal with Paula Deen was a "Dumb" idea from a marketing perspective. Many people who were unsure may now think it wasn't such a dumb idea after all. What do you think? From a marketing perspective, is the Novo Nordisk deal with Paula Deen Brilliant or Dumb? Is Deen Positioning Herself as a Potential CHANTIX Spokesperson? I just picked up a copy of People magazine and learned that "Paula's Next Challenge: [is] Quitting Smoking." She says she "thinks about quitting every day...My husband has quit for over a year now. Maybe one day I'll be ready. I pray that I will," said Deen. If past experience is any guide, Deen will be "ready to quit" as soon as she closes a deal with Pfizer to be its CHANTIX celebrity spokesperson!